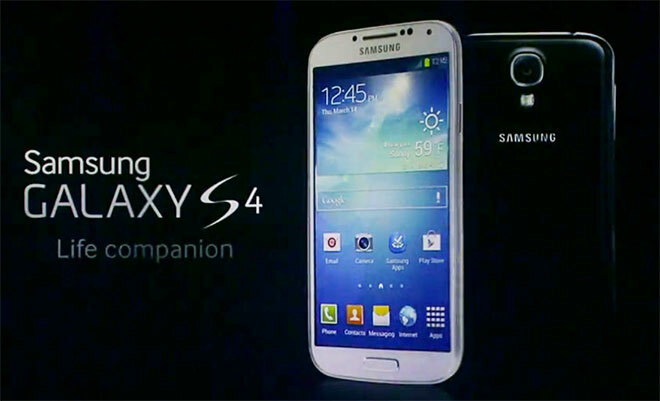 The Samsung Galaxy S4 was officially unveiled to the world a few days ago amidst much fanfare and phenomenal hype. For those expecting who were expecting the Galaxy S4 to usher in a new era of smartphone intelligence, it falls short of those high-handed expectations; however, the Galaxy S4 is a brilliant new innovation that will help further establish Samsung’s dominance in the high-end smartphone market in the near future. Samsung announced two major versions of the Galaxy S4 handset – the 4G US LTE version with a quad-core chipset and an international version with an octa-core CPU. It will retail with 2 attractive color variants named Black Mist and White Frost and come in storage variants of 16 GB, 32 GB and 64 GB. The US 4G LTE version of the Galaxy S4 will be powered by a quad-core 1.9 GHz Qualcomm processor supported by an Adreno 320 GPU with a RAM capacity of 2 GB, and will run the latest version of the Android 4.2.2 Jellybean OS with a TouchWiz interface overlay. The international version featured a 1.6 GHz Exynos 5410 octa-core processor supported by a PowerVR SGX 544MP3 GPU. The Galaxy S4 clocked an overall performance speed more than twice of its predecessor; making it the fastest smartphone in the market today. It’s also important to consider that the next Android OS, Key Lime Pie is scheduled for launch this year and it is highly likely the Galaxy S4 handset will be fast-tracked to receive that update first. Although the Android-powered Galaxy S4 handset draws heavy influence from its ultra-popular predecessor in terms of basic design and features, it is lighter and slimmer than the Galaxy S3 and sports a nice polycarbonate build that gives it a more premium feel. The Galaxy S4 features a magnificent 5-inch Full HD Super AMOLED Display with a striking 441 ppi pixel density. The Galaxy S4 packs a 13 MP back camera and a 2 MP front-facing camera that can both be used simultaneously. It also packs a larger 2,600mAh battery that makes it perfectly suitable for heavy media usage and 4G browsing. The Galaxy S series of smartphones are renowned for the vast variety of interesting software add-ons and apps built into them, and the Galaxy S4 carries on that tradition with absolute finesse. The upgraded S Voice, S Health, S Voice Drive, ChatOn and S Translator apps add great value to the Galaxy S4. Additional standout features include the media sharing Group Play function, TV control app and an extensive set of camera tools. The biggest question that most users have in mind at this point is how exactly does the Samsung Galaxy S4 compare to the iPhone 5 and what competitive edge it holds to make you jump on the Samsung Android bandwagon. 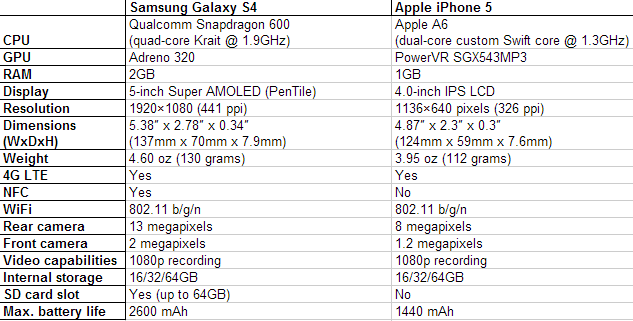 Here is a head-to-head analysis of specifications and features sported by the two mammoth high-end smartphones. Perhaps the biggest venture made by the Samsung Galaxy S4 into next-gen smartphone technology is the implementation of eye-tracking and gesture capabilities. Even though it does not deliver the heavily rumored “scrolling via eye tracking” feature, the Galaxy S4 does a reasonable decent job at integrating gesture recognition and eye-tracking capabilities to take your navigation experience to the next level. The Air View feature lets you access any content you want to view by simply moving your finger over their icons on your smartphone display screen and the Air Gesture feature facilitates easy scrolling back and forth between the web pages you are seeing by sweeping your hand over the screen. It can track your eye movements to pause or play videos and you can tilt your smartphone to scroll up and down the page you are viewing. Overall, the Samsung Galaxy S4 is as high-end as high-end smartphones can get and takes a bold step in initiating the shift toward next-gen smartphone technology. It is one of the most fully loaded smartphones ever built and despite its status as an evolutionary upgrade rather than a revolutionary one, the Galaxy S4 is destined to be an ace in the pocket of Samsung smartphones that will be one of the strongest competitors to upcoming high-end handsets like the HTC One and iPhone 5S.